Michigan’s gubernatorial candidates weigh in on whether they would support or oppose legislation that would allow police to seize firearms from people deemed in danger of committing violence by courts. Last week, a mass shooting at a Florida high school once again renewed a national conversation about what can be done to prevent future tragedies. One solution offered by lawmakers around the country is a “red flag” law. These laws, already in place in five states, make it possible for courts to order law enforcement to temporarily seize weapons from people who are considered a danger to themselves or to others. Michigan is one of 18 states that have proposed similar bills: House Bills 4706 and 4707, introduced by Democratic Reps. Robert Wittenberg of Huntington Woods, Jon Hoadley of Kalamazoo, and Stephanie Chang of Detroit in June. Bridge asked all of the declared candidates for governor whether they would support or oppose this bill if they were in office and why. Their responses are edited for clarity and length. Related: Will Florida school shooting nudge Michigan to pass ‘red flag’ gun laws? "America is facing a mental health crisis and we must find ways to provide resources to help those who are hurting or may hurt others. In particular, school violence was a major concern for Attorney General Schuette when he took office, and that is why he worked with the Michigan State Police and schools to create Michigan’s OK2SAY school safety initiative," spokesman John Sellek wrote in an email. "In the bigger picture, Attorney General Schuette also has deep concerns with the general coarsening of our culture, where casual violence and killing is treated as mere entertainment, especially when it is directed at our youth. We have not seen these bills but we will look at them as we review all the factors that may play a role in finding more solutions, like OK2SAY, to stop violence." Calley did not respond to Bridge’s requests for comment Monday and Tuesday on “red flag” legislation. Colbeck’s spokeswoman, AnneMarie Schieber Dykstra, said in an email Monday he needs to review the bill in more depth before giving a definitive answer. Spokesman Dave Doyle said Hines didn’t get a chance to read the bill, so he couldn’t comment on the legislation in particular. “It’s his understanding that local police already have that authority to confiscate someone’s guns if they’re deemed a threat and that individual could get their weapons back if they petitioned a court,” Doyle said. “I would not support any law that infringes upon the right of Michiganders to keep and bear arms. I would vehemently oppose any such ‘red flag’ law,” Wood wrote in an email. Cox said he could not comment directly on the bills because he does not yet have enough knowledge on them, but offered thoughts on gun control legislation in general. Supporting these laws is a no-brainer. Not everyone can flag you, only those who know you, any conditions you may have or anything that may not be in the public domain as of yet. A parent or guardian could have weapons taken away from a child with mental health issues. Excellent that Bridge included ALL known candidates for Governor, including the Green Party of Michigan one, Jennifer V. Kurland. Greens do not take any corporate or PAC campaign contributions, so we certainly don't take NRA money. What a bunch of weasels. Take a stand, for goodness' sake. At least the Democrats and the Libertarians are willing to stand up for their beliefs. The Republicans talk in circles and twist themselves up into knots to avoid giving an answer. We get the message. If elected, every Republican will do exactly as his party leader tells him. Telling us you haven't done your homework is not an excuse. In an age where we can have credit card approval in a matter of minutes, why can't we have some kind of screening process for mentally illness? There are always outliers but it seems these mass shooters have a fairly consistent profile of across the board dysfunctionality, (is that a word? ), in education, career and relationships. Not to mention they're almost always males under 30. Then these Red Flag procedures mentioned in article could be used as an affirmation or negative affirmation for those screened out. While some may disagree for Second amendment absolutist reasons, this keeps the solution focused on the person not the inanimate gun. Interesting picture at the top of this story. Not one of the guns shown looks like an "assault" rifle. My guess is that every one of them will fire just as fast as an AR-15 or other so called "assault" rifle, could have a "large" magazine, and could come chambered for the same 5.56mm NATO round used in the AR-15. Are the rifles shown in the picture the ones intended to be removed from dangerous people? And will they be removed from the household that a dangerous person lives in (remember that the Sandy Hook shooter stole the rifle from his mother). Lots of questions, and very little thought seems to have gone into this issue other than "we need to remove all guns from society". Bridge shows typical pathetic journalistic ignorance here. 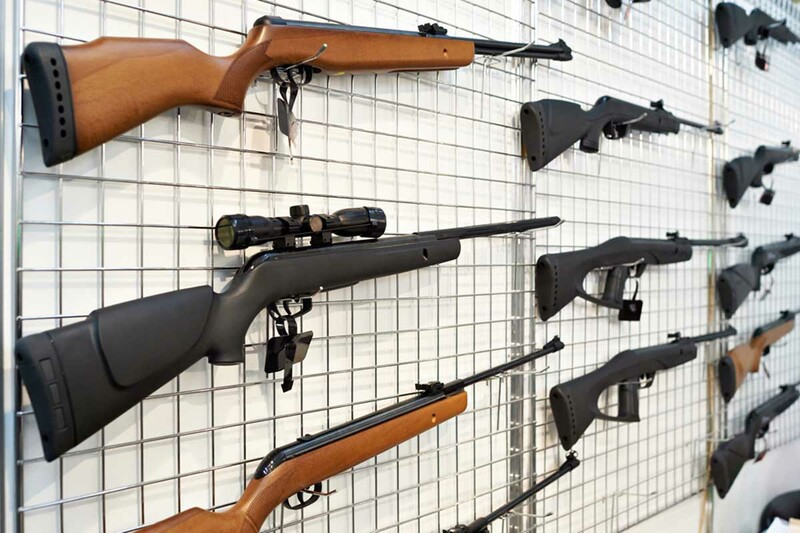 Picture shows a picture of a bunch of Air Rifle pellet guns, not considered Firearms! But evidently everyone there is too ignorant on the subject to recognize it. Would you like to be a Black Teacher holding a handgun when the Cops show up at school shooting? Really Schuette?!? I'm disappointed, you have an opinion about everything.